The Dingo's ability in Post Hole Digging is truly astounding. It can dig holes up to a massive 750mm (30 inches) diameter to a depth of at least 1.5 metres (deeper with extensions). This pressure converts directly to power to give more drive torque to the augers. The power is delivered to the augers by the post hole digger drive head. This unit not only drives the augers for hole digging, but also drives the cement mixer bowl and the Wombat spot cultivator. When it comes to the augers, we use a brand that is recognised as the best. It’s the cutters that are important in digging. These cutters, and how they are positioned, are the result of years of digging experience. The cutting teeth are interchangeable - earth and tungsten teeth for all dirt conditions and rock tips for those really hard conditions that need grinding away at. If it is diggable, or even grind-away-able, then a hole can be dug. Some just take a little longer. 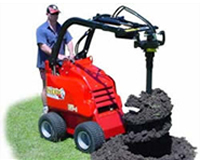 Our “Dingo Augers” are set up in a way to give faster digging at less cost in all dirt conditions. To do this we use a standard earth pilot (worm) with earth spear teeth in all but the outside position. In the outer position, which experiences the most wear, we put tungsten teeth. Digging Depth: Augers 300mm and over dia - 1.5m; Augers under 300mm - 1.1m + extensions. Cut Width: 100 - 750mm in 50mm increments. Teeth types: Earth, Tungsten, Rock. We recommend our ‘Dingo’ setup. Used For: Digging post holes in soil, clay, sand, rock and shale. Used By: Contractors, fencing contractors, landscapers, Hire Companies.